The China-ASEAN Free Trade Area (FTA) was fully completed on January 1, 2010 and since then China has become ASEAN's biggest trade partner while ASEAN has become the third largest trade partner of China. China-ASEAN FTA (CAFTA) is the first free trade agreement of China's foreign negotiations and the biggest free trade area. CAFTA has vigorously promoted the stable and rapid development of the bilateral trade and economic relationship in a long term. In 2002, when the CAFTA was just started, the bilateral trade volume was US$54.8 billion. By 2014, the bilateral trade volume rose up to US$480.4 billion, increasing 9 times during the 12 years with an annual growth of 20%. 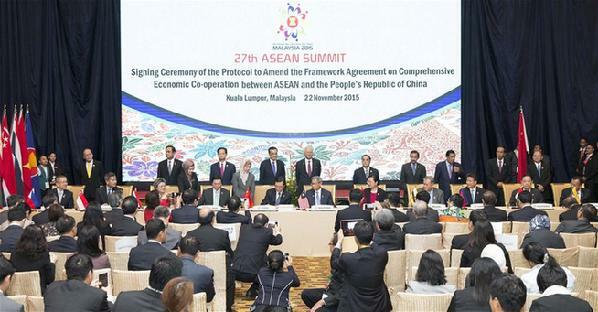 China and ASEAN sealed a deal to upgrade the existing FTA on November 22, 2015. Covering a wide range of areas including goods, services, investment, and economic and technological cooperation, the upgrade will provide fresh momentum for economic development of both sides. The China-Pakistan Free Trade Agreement (FTA) officially took effect in July 2007. The two countries signed the agreement on November 24, 2006. 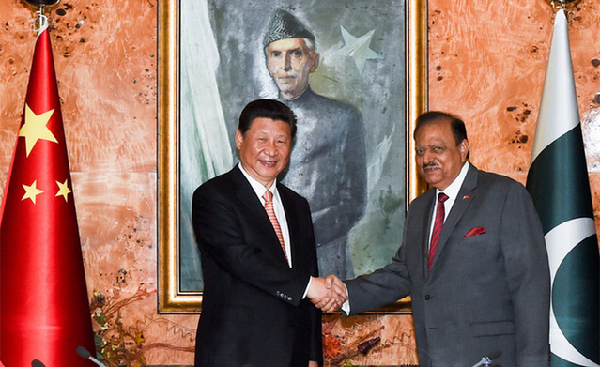 Negotiations were launched in April 2005 during former Chinese Premier Wen Jiabao's visit to Pakistan. Since the establishment of China-Pakistan FTA, more business opportunities and convenience have been brought to the enterprises of the two countries and more benefits have been brought to consumers of the two countries. The bilateral trade volume has maintained rapid growth, increasing from US$6.9 billion in 2007 to US$16 billion in 2014 with an annual growth of about 15.3%. 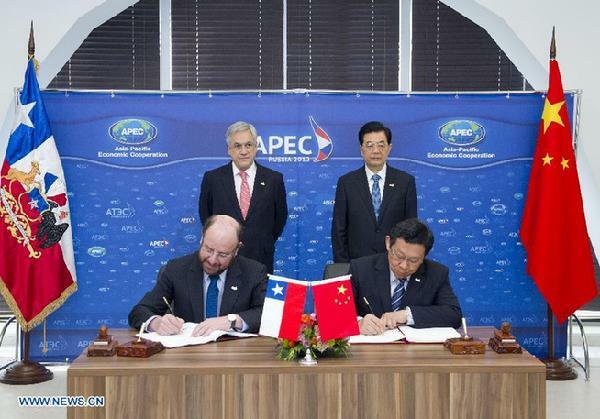 In November 2005, then Chinese President Hu Jintao and former Chilean President Ricardo Lagos witnessed the signing of the China-Chile Free Trade Agreement (FTA). The agreement entered into force in October 2006. Under the agreement, China and Chile will extend zero duty treatment phase by phase to cover 97 percent of products in ten-year time. On April 13, 2008, then Chinese President Hu Jintao and Chilean President Michelle Bachelet witnessed the signing of The Supplementary Agreement on Trade in Services of the Free Trade Agreement between the Government of the People's Republic of China and the Government of the Republic of Chile, in Sanya, Hainan Province. 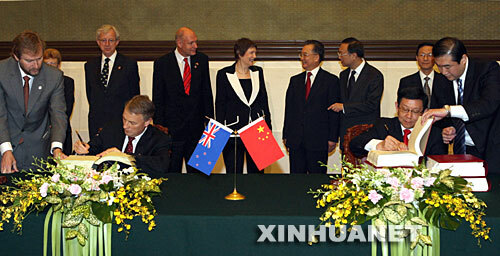 On April 7, 2008, then Chinese Premier Wen Jiabao and former Prime Minister of New Zealand Helen Clark witnessed the signing of the China-New Zealand Free Trade Agreement (FTA) in Beijing, which entered into force on October 1, 2008. The agreement is the first comprehensive FTA that China has ever signed as well as the first FTA that China signs with a developed country. China and New Zealand formally launched the free trade negotiations in December 2004 and concluded the talks in December 2007 following 15 rounds of negotiations. According to the agreement, all goods exported from China to New Zealand will be tariff free from January 1, 2016 while tariffs on most New Zealand exports to China will be eliminated from January 1, 2019. China and Singapore signed the China-Singapore Free Trade Agreement (FTA) on October 23, 2008, during Singaporean Prime Minister Lee Hsien Loong's visit to China. Negotiations on the FTA started in August 2006, and through 8 rounds of talks, the two sides successfully completed the negotiation in September 2008. The China-Singapore FTA is a comprehensive free trade agreement, covering commodity trade, trade in services, personnel flowing, and customs procedures. China has become Singapore's largest trading partner and largest investment destination, and Singapore is China's second largest trading partner and second largest investment source in ASEAN countries. On April 28, 2009, the Chinese and Peruvian Governments signed the China-Peru Free Trade Agreement (FTA) in Beijing. The China-Peru Free Trade Agreement, which went into effect on January 15, 2010, is the first comprehensive FTA China has signed with a Latin American country. China and Peru commenced FTA negotiations on September 7th, 2007, when then Chinese President Hu Jintao and Peruvian President Garcia attended APEC informal leadership meeting in Sydney Australia. Since 2012, China has been Peru's main trading partner and the leading destination for Peru's total exports. In 2014, China also became its main supplier of capital goods and leading investor, with US$18 billion. 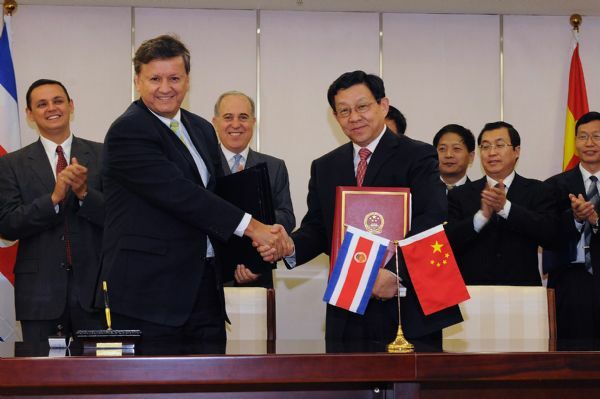 The China-Costa Rica Free Trade Agreement (FTA) was put into effect on August 1, 2011. FTA negotiation was launched in January 2009 following then Chinese President Hu Jintao's visit to the Central American country in November 2008. After intensive negotiations for more than a year, the two sides signed the FTA agreement in April 2010. As for the trade of goods, at least 90 percent of the goods from both sides will gradually enjoy zero tariff access to each other's markets. As for the service trade, Costa Rica will further open 45 sectors to China, including the telecommunications, education, and tourism sectors, while China will further open seven service sectors to Costa Rica. Bilateral trade between China and Costa Rica grew to US$5.3 billion in 2014, a 145-percent increase over 2006. 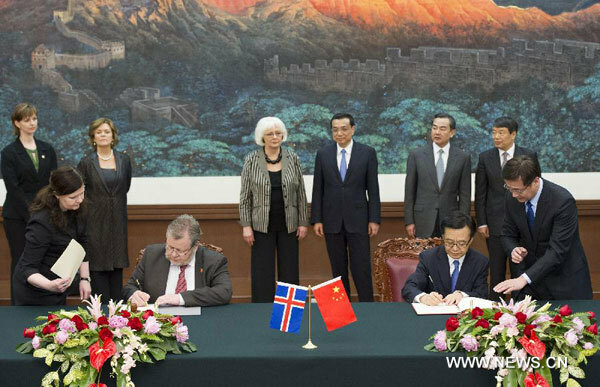 The Free Trade Agreement (FTA) between China and Iceland took effect on July 1, 2014. Iceland is the first developed European country to recognize China as a full market economy as well as the first European country to negotiate a free trade agreement with China. 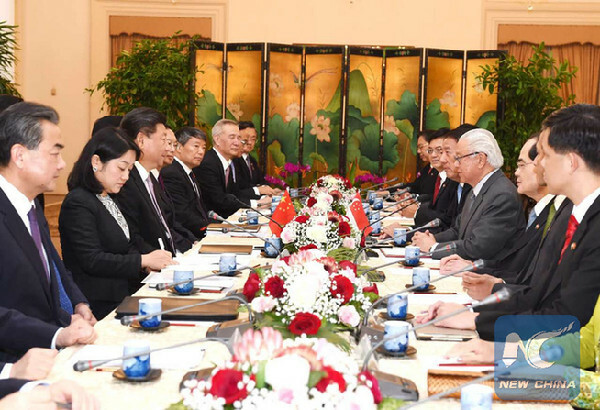 The two countries started FTA negotiations in April 2007 and signed the agreement in April 2013 under the witness of Chinese Premier Li Keqiang and Iceland Prime Minister Johanna Sigurdardottir. 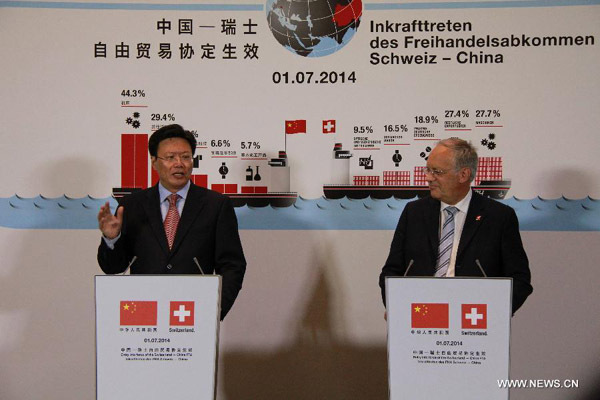 The China-Switzerland Free Trade Agreement (FTA) officially entered into effect on July 1, 2014. FTA negotiation between the two countries was officially launched in 2011. 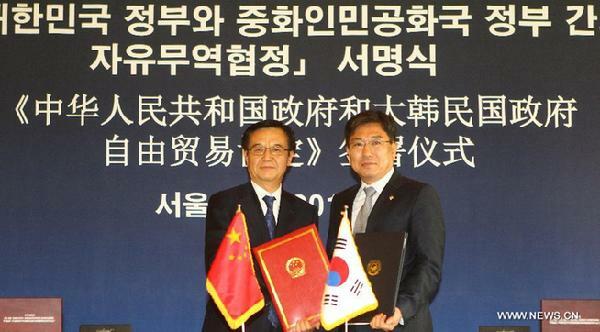 After nine rounds of negotiations, the two sides signed the agreement in July 2013. China-Switzerland Free Trade Agreement is the first bilateral free trade agreement signed between China and a country on the European continent and one of the world’s top 20 economies. Under the FTA agreement, about 99.7% of China’s exports to Switzerland will be zero tariffs and the free-tariff percentage of Swiss’ exports to China comes to 84.2%. The free trade agreement (FTA) between China and South Korea officially came into force on December 20, 2015. Under the agreement, South Korea will eliminate tariffs on 92 percent of all products from China within 20 years after the implementation, in return for China abolishing tariffs on 91 percent of all South Korean goods. Negotiations on the FTA were first brought up in September 2004 when trade ministers of the two countries met on the sidelines of the ASEAN-plus-three meeting of economic ministers. The first round of negotiations was launched in May 2012. The two sides signed the FTA agreement in June 2015 after 14 rounds of negotiations. 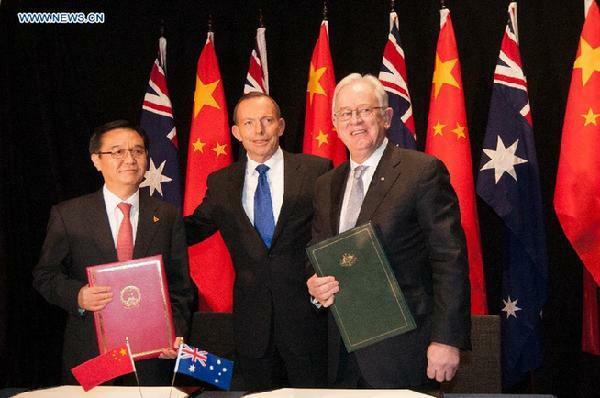 The China-Australia Free Trade Agreement (FTA) officially went into effect on December 20, 2015. Once the agreement is fully implemented, 96 percent of Australian goods will enter China duty free, while 100 percent of Chinese exports to Australia will enjoy zero-tariff treatment. Negotiations started in 2005 and were greatly accelerated after Chinese President Xi paid a state visit to Australia in November 2014. The agreement was signed on June 17, 2015. China is Australia's top trading partner, with the two-way flow of goods and services exceeding US$135 billion in 2014.